Chances are you haven't paid much attention to A.O. Smith, WD-40, Cintas, The Estee Lauder Companies, or Autozone as potential investments. If so, you're missing out. A major misconception in investing is that the only stocks that beat the market over time are smaller, fast-growing companies in red-hot industries. You know what I'm talking about, the tech unicorns or the breakout biotech stocks. 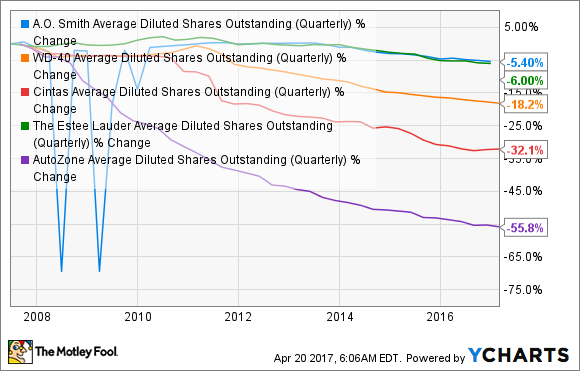 This mentality overlooks some of the best market-crushing stocks: Companies that barely make the headlines, but continually generate high rates of returns that reward shareholders. If you need proof that investing in companies like this are great investments, consider these five companies: water heater manufacturer A.O. Smith (NYSE:AOS), household maintenance marketer WD-40 (NASDAQ:WDFC), uniform rental specialist Cintas (NASDAQ:CTAS), cosmetics and hygiene product manufacturer The Estee Lauder Companies (NYSE:EL), and aftermarket automotive parts retailer AutoZone (NYSE:AZO). 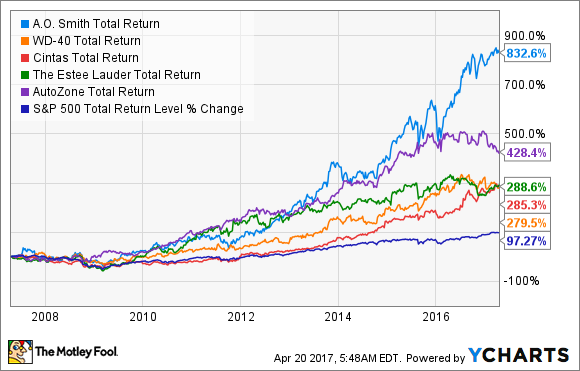 Over the past decade, all of these companies have more than doubled the total return of the S&P 500. Here's a quick breakdown of why these companies are able to continuously generate market-crushing returns. At first glance, it's not easy to see what these disparate businesses have in common. The phrase "I need a water heater, a replacement alternator, some eyeliner, and a chef's coat" only exists in the setup to some bizarre prank. It's not the specific products or services that these companies sell that unites them. Rather, it's the traits of those sales that make them compelling. There are three basic traits that all of these companies share: They are all in repeat-purchase or recurring-revenue businesses, they sell high-margin products or services, and the capital requirements for their businesses are modest. Perhaps the one company in the group here that doesn't completely fit that mold is A.O. Smith. After all, consumers aren't buying new hot water heaters every six months. That said, more than 80% of boilers and water heaters sold in North America are replacements for older systems rather than new construction. This makes sales in the business remarkably consistent. With a well-established consumer base and consistent demand in place, each of these companies has incredible pricing power that leads to high margins. For WD-40 and Estee Lauder, that pricing power comes down to their high-value brands that command a high price point. For Cintas and A.O. Smith, it's providing and essential product of service where they are market leaders. And for AutoZone, well, selling aftermarket parts for vehicles is akin to printing money (this is coming from a person whose family was in the automotive repair business for a long time). 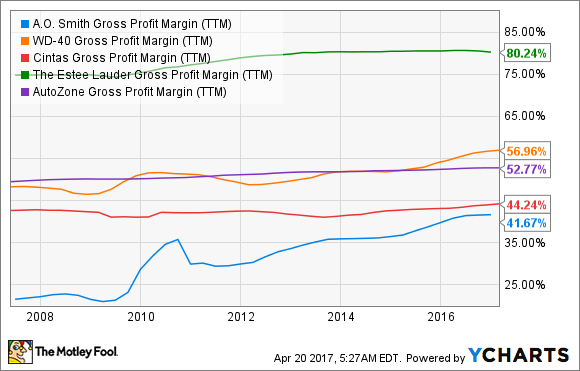 It's no surprise, then, that all of these companies have gross margins of 40% or more. All of these things are great, but what puts all of these companies over the top is that their respective businesses don't require a lot of reinvested capital. WD-40 is the shining example of this. It doesn't even manufacture its own products -- they are contracted out and manufactured by third parties instead. Over the past 20 years, the company has only spent $65 million on capital expenditures. While the rest of these businesses certainly aren't on the same level of asset-light businesses as WD-40, all of them are able to maintain their current operations with little capital improvements. What is also important here is that all of them are in relatively mature markets, so investing in growth is minimal. 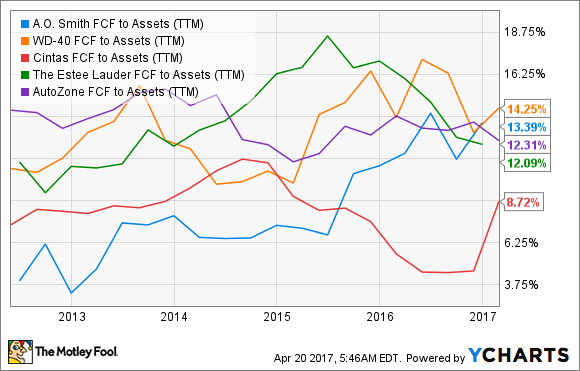 As a result, each of these companies generates loads of free cash flow on a regular basis without anywhere to reinvest it. If you are on the hunt for market-crushing stocks, chances are you will look at the high-flying, newsworthy companies that analysts espouse for their ability to disrupt the status quo. In reality, though, companies that keep the status quo can be just as valuable for your portfolio. No one is going to think you are a Wall Street soothsayer for owning stocks in cosmetics, auto parts, work uniform rentals, or hot water heaters. But if you want to grow wealth over time, it's hard to argue with what A.O. Smith, WD-40, Cintas, Estee Lauder, and AutoZone have to offer.